We rarely think of them, and when we do it is in a trifle and demeaning way. If our friend or sibling does something untoward or infantile, we might call him or her a baboon. Well, perhaps no longer. 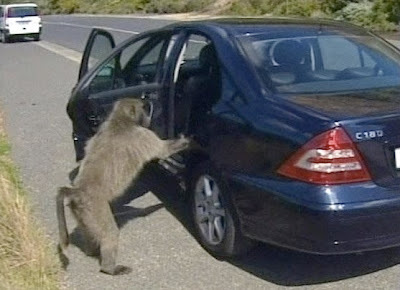 "I know as humans we generally find staring rude, but baboons have taken it to another level. If you stare at a baboon it is seen as a threat. He'll kill you. 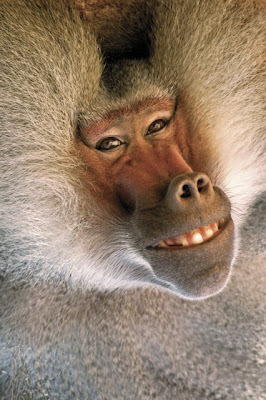 Perhaps that sounds draconian, but baboons seem to be more socially conscious and polite because of it." The main baboon in the study goes by the name of Rupert. And, just to mess with him, this reporter stared at him from behind. After about 15 seconds Rupert lashed out and began banging ruthlessly on the cage. "Rupert is a special baboon. He has a sixth sense when it comes to people staring at him. He can tell from a mile away. He can even tell if some inanimate object is staring at him. Why, just last week he put the smack down on his stuffed teddy bear," said Dr. Hammond. "Rupert is a little beyond the curve for baboons when it comes to reinforcing social norms. He's so human-like in that respect." "He got a funny look from his grandmother. We called her Miss Loulou. He ate her alive and then urinated on her dead body." That being said, I thanked Dr. Hammond and decided not to stare at Rupert again. But, to show that there was no hard feelings, I left him a banana. Rupert shrieked at me. "Oh, he's allergic to bananas. And he got into a fight with one last week," said Dr. Hammond. For more fun watch this video. You've seen those commercials for them on TV. 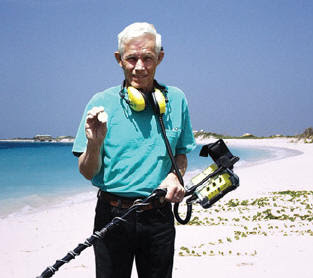 An old man plods along a pristine beach at sunset with headphones on and a metal detector on the ground. He waves it over a choice piece of sand, and voila! The camera pans to a close-up of his hand holding a gold deblume. Then it is followed by a bunch of interviews of lucky metal detector owners who against all odds actually found something. And all you have to pay is 6 easy installments of $19.95! Could life get any better? 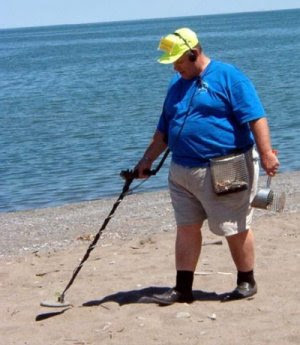 Well, just this morning, Chester Dodgyfield from Virginia Beach made a great discovery with his trusty metal detector (he calls her Susan). He found the lost city of Atlantis. "Me and Suzy just went for a stroll on the beach, and all of the sudden she just wouldn't shut up. She was all beep this and beep that. So, I bent down, testing my arthritic back and started scraping away sand. After only about two handfuls I saw this thing that looked like a metal pumpkin. Well, I had to call Cheryl." Cheryl is Mr. Dodgyfield's pet dog. "So I call and I said to her, 'WE FOUND IT!' She said, "Found what?" And I repeated, 'WE FOUND IT!' This went on for quite some time, and people starting staring at me as I was barking into the phone...So anyway, I went to my neighbors house to borrow his backhoe." After the first few hours, the beach was full of spectators. Local residents came out from coffee shops. Even some of the re-enactment actors from Colonial Williamsburg came by in carriages. It turned out that Mr. Dodgyfield's pumpkin was a portico on the top of what archaeologists later presumed to be a Temple. "We got a call that some kook and his dog had found an artifact on the beach. I assumed it was a revolutionary era piece. Turns out we were wrong. We've never found the lost colony of Roanoke, but who could've guessed that we'd find Atlantis so close. If I weren't so excited right now, I might have more time to value the irony," said Harvey Moons, head researcher at the Duke University School of Archaeology. Mr. Dodgyfield has been thwarted by local government officials from claiming his new prize. He submitted his claim under the notorious "Finders Keepers Rule" which up until now was unchallenged. Asked what he would do with Atlantis if the courts ruled in his favor he said, "I'd probably turn it into an amusement park. I think I'd be pretty competitive with Busch Gardens and that other resort in the Bahamas called Atlantis, because I got the real thing." 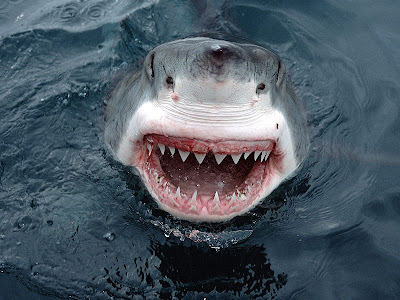 Tragedy has struck the people of Martha's Vineyard this afternoon as their beloved Great White shark, of the Jaws movie series fame, met his unfortunate demise. It was hardest for those who knew him best. Richard Dreyfuss and Roy Schneider, who played alongside one another and worked with the shark in the blockbuster movies called the Mayor of the island with their condolences. The beautiful animal was found floating on his side just a mile from Aquinnah public beach. After an autopsy and inquiry was done it was discovered that he had choked on a baby seal. "Those baby seals seem to invade the water this time of year. They're a real health risk if you ask me. I'm hoping the town enacts a law to legalize more [seal] clubbing," said Joe Sharpipo of Fuller Street. It seems the seals are attracted to the island because of its plentiful fisheries and nice beaches. Some neighbors have complained that the seals have woken them up with their barking early in the morning. Others have claimed that their cars have been vandalized with seaweed. 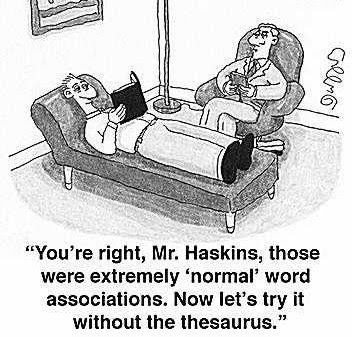 "They're more than a nuisance. They've become a plague. And now this. This is the last straw. They killed our shark. Those seals have no shame," says Margaret Hosenbothom. As Martha's Vineyard mourns, the firestorm the seals have caused has led to high tensions among the town's folk. Just this morning, a man who advertises for a water park in nearby Buzzard's Bay wearing a seal costume, was repeatedly assaulted by billy clubs and shillelaghs. The perpetrators have not been apprehended, but were reportedly screaming unintelligible gaelic swears and wore seal scalp necklaces. How important is perspective? How important is attitude? Can one overcome the other? Are they the same? Is it a cube? Is it a box? Are you a cube? A box? Or a square? 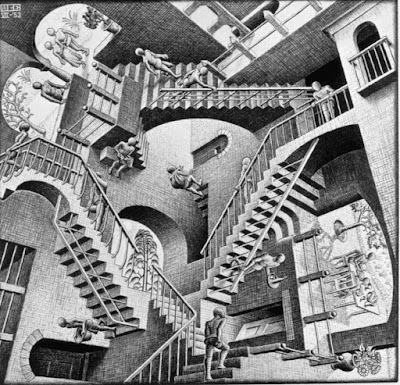 On which set of stairs do you find yourself? Do you even take the stairs? Did you know that going up stairs is better on your knees than going down? 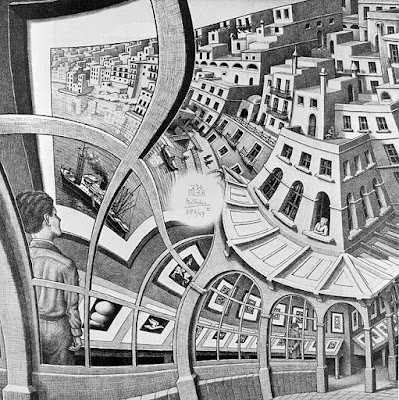 Are you bald with no face like Escher's people in this drawing? Are you looking at the painting? Or is the painting looking at you? Or are you looking at a painting of someone looking at a painting that is also looking at him, and possibly you? Do you prefer nyquil or codine? Think about it. Just like the Flight of the Conchords prescribe. Her name was Carol. She was just like any of us. She woke up every morning and put one pant leg on at a time, and ate a lackluster breakfast. She would sing in the shower. She loved sipping hot chocolate on a cold winter day. 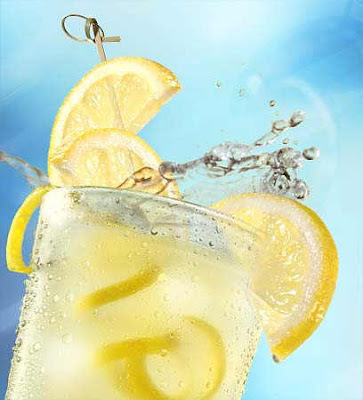 And, she loved a cool, refreshing glass of lemonade on those hot summer days. It was this love for lemonade that did her in. It was mid July. Carol had gone out to her garden to do some weeding. After vigorously arguing her case with a rather stubborn dandelion and losing, she came back inside, her brow dotted with large beads of sweat. As she entered the house she thought to herself, "It sure would be nice to have a glass of lemonade." So, she went to the kitchen. On the counter was a glass of opaque liquid with what looked to be lemonade pulp at the bottom. Parched and worn, she reached for it and glugged it down. It was perhaps the strangest lemonade she had ever had. The pulp seemed to have a life of its own. Everything became clearer as her nephew Tommy came in from another room and screamed, "MY SEA MONKEYS! YOU KILLED MY SEA MONKEYS!" As little Tommy began bawling, Carol had the sudden urge to vomit. But, swallowing sea monkeys* and upsetting her nephew was not all she had done. She also incurred the wrath of PETA. After Carol's story was made headline news, due to her lawsuit suing the sea monkey company for her horrible new chronic abdominal troubles, PETA wanted in. "Those sea monkeys were kept in a cramped, poorly oxygenated glass for days, and it was only a matter of time before someone drank them or they boiled in the a cloud of their own excrement," said Suzanne Zibilsky of PETA. "We will pursue this case to the fullest extent we can. Sea monkeys are just like you and me. They can feel, and taste, and even know how to swim. Yet, they have become second class life forms. We value all life." Carol and Tommy have both received court summons on behalf of the sea monkeys' remaining living relatives in conjunction with PETA. People have been protesting for the past several months on Carol's lawn, even going so far as to trample her garden. Looking at the bright side Carol said, "Well, at least I don't have to pull out that dandelion. It's dead. Probably in the same place as those blessed sea monkeys." Even as everyone doubted him, he came out to support democracy. He is now running as mayor of backwoods town in Montana. The residents are a commune of hermits. Yes, I know it sounds oxymoronic, but they all live alone in their respective caves, trees, underground burrows, or abandoned mine shafts and they only know of each other's existence by passenger pigeon. And, only discovered Sasquatch's existence after several of their passenger pigeons did not return. Having eaten several pigeons and leaving hairballs in front of the homes of the local hermits, he was lauded. Almost every hermit was pleased with the Sasquatch's efforts to make them more fundamentalist. They felt their pigeon communication was making them less of the true hermits they believe themselves to be. His campaign has been completely funded and run by a man who goes by the name Samuel "Guffnupper" Harrison. No one in the community knows who Guffnupper is, but they appreciate his efforts. "Sasquatch don't speak anglesh, and don't like people en pigeons en stuff en he don't care if he wins, so he's the right guy fir the job." so says Guffnupper. 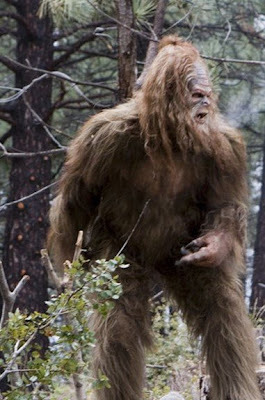 The campaign's main tenets are apathy, reclusiveness, and hairiness, all of which are undeniably qualities that Sasquatch possesses as do his constituents.